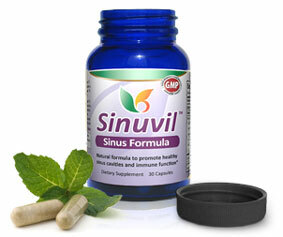 Suffering from Painful Sinus Infection? 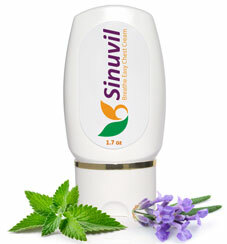 Read this site in detail and discover how to help your SINUSES - THE NATURAL WAY! 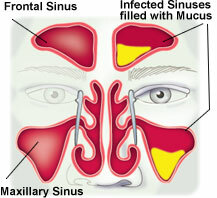 Acute sinusitis - an infection that is often triggered by the flu or cold. The flu or cold virus attacks your sinuses causing them to swell and become narrow. Your body responds by producing mucus. When the sinuses become blocked and are filled with mucus, viruses, fungi or bacteria can grow and cause infections that cause pressure and headache. Chronic sinusitis - an infection that lasts for more than 3 weeks and can continue indefinitely if not treated. It is often caused by allergies, fungal infections or weakened immune system. 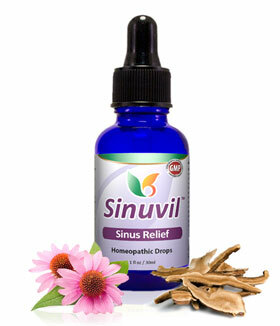 Sinuvil kit is a set of three natural products beneficial for anyone suffering from the symptoms of inflamed sinuses. 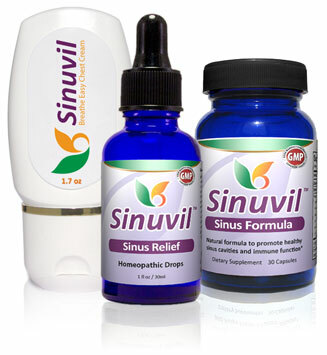 Sinuvil Sinus Relief is a non-prescrition medicine, formulated with officially recognized active homeopathic ingredients, as listed in the Homeopathic Pharmacopoeia of the United States (HPUS), which is an FDA-recognized compendium for homeopathic medicine. U.S. government required disclaimer: There is no scientific evidence that homeopathic products work and product's claims are based only on theories of homeopathy from the 1700s that are not accepted by most modern medical experts. Important Product limitations. 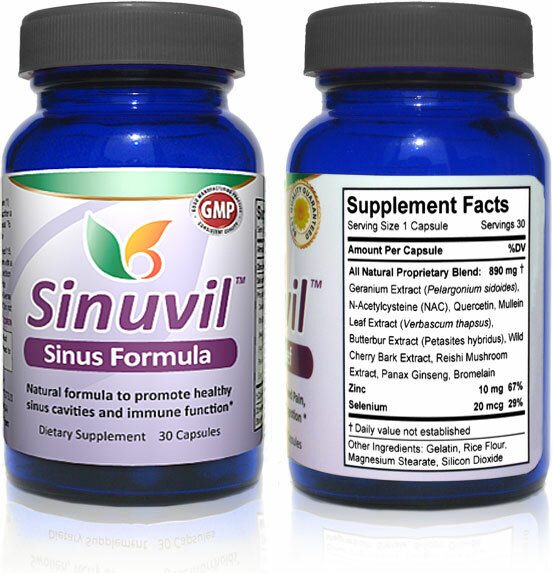 Sinuvil Sinus Relief is a homeopathic medicine that contains active ingredients that are listed in the Homeopathic Pharmacopeia of the United States (HPUS). Active Ingredients: Apis mellifica, Baptisia tinctoria, Colocynthis, Hepar sulphuris calcareum, Histaminum hydrochloricum, Hydrastis canadensis, Ignatia amara, Kali bichromicum, Lemna minor, Mercurius vivus, Pulsatilla, Rhus toxicodendron, Sabadilla, Thuja occidentalis. † No statements or other information contained on this Website have been evaluated or approved by the Food and Drug Administration (FDA). These statements are based upon traditional homeopathic practice. Homeopathic remedies may not be effective for everyone. Always use our natural products as a complement to your physician’s guidance and counsel. U.S. government required disclaimer: There is no scientific evidence that homeopathic products work and product's claims are based only on theories of homeopathy from the 1700s that are not accepted by most modern medical experts. PELARGONIUM SIDOIDES is a medical plant native to Africa. Clinical studies show that it's effective for supporting the respiratory tract..* . 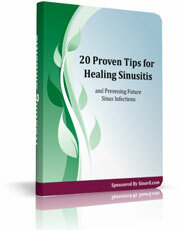 In this e-book, you'll learn about 20 key tips to stop sinus infection in its tracks. This no-nonsense e-book offers practical advice on what YOU can do today to feel better instantly. Order now and receive this free e-book INSTANTLY by email, so that you can start applying the advice and START FEELING BETTER TODAY! We stand behind our products! All Sinuvil products are manufactured in FDA registered facilities that exceed the highest standards for quality control, safety and ingredient purity.